Sacro Ease Keri Back Support 12" & 15"
The McCarty’s Sacro Ease Keri Back support is a product designed to give superior back support. 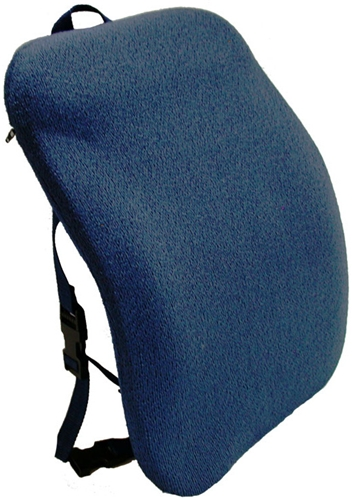 A steel frame and rubber supports help this back cushion provide far more support than foam only products. The Keri Back can be used at work in office chairs, at home on the couch, or in the car. The strapping system is easily adjustable to secure in place after it is positioned. Straps can be either horizontal or vertical, simply choose which version you would like. The vertical straps are perfect for those with seats that are too deep or concave for the traditional horizontal straps. Complete with comfort memory foam, this back will provide maximum comfort while supporting your spine. Available in 15" (KBT) or 12" (KBN) wide models. Steel frame and rubber supports. Available with horizontal or vertical straps. Made with an adjustable (bendable) steel frame, rubber supports, and soft fabric. Great when you need posture correction but do not have the room to have the seat under you.